January, 2019 | Anderson Electric Corp. The lighting for your house you think about the most is the indoor lighting. This makes sense, as most of the time you’re around your house you are inside it, not outside looking at it. Unfortunately, this means that outdoor lighting needs often go ignored. Proper outdoor lighting is one of the most cost-effective ways to beautify a house. It’s also beneficial for home security and to improve safety for walking around the house during the evening. A poorly illuminated path can end up being dangerous. We provide outdoor lighting installation work, but we also can help with repairs for current lighting setups. 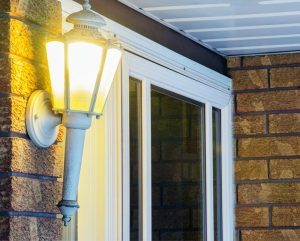 There are some simple fixes to outdoor lighting you can do on your own, like changing a light bulb. But it’s important to know when you need to call a licensed electrician familiar with exterior lights for the repairs.